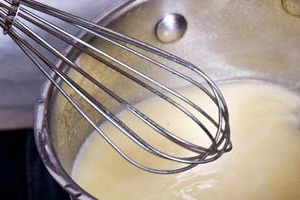 A butter emulsion similar to the more common beurre blanc, beurre fondue is usually used as a poaching liquid instead of a sauce. Though very rich, beurre fondue takes on flavor well (including fat-soluble flavors that might not otherwise be extracted) and passes those flavors to additional things poached in it. For example, try poaching wild ramps (or substitute any kind of onion) or fresh wild mushrooms in the butter first, then pull out the ramps and poach halibut cheeks in the same beurre fondue. Put about ½ inch of water in a pan, and heat it to a simmer. Keeping the liquid at a simmer, slowly whisk in cubed butter (1 ½ sticks used here). Because “breaking” (the separation of an emulsion into its component parts) is a risk with hot, butter-based emulsions, heat control is very important. Err on the side of having the emulsion too cool and reduce the heat as you add more butter. You want the butter to melt gently into the water. If it the mixture breaks (and starts looking oily rather than smooth), try adding a little more water and whisking vigorously. There is a chance that this will allow you to rebuild the emulsion without having to start over. I think you’re correct, beurre fondue & beurre monte are the same thing: a large quantity of butter melted and emulsified in a small quantity of hot water, used for poaching, etc.